Over 30 paintings of Jodie Maurer’s are on display at Peace Haven in St. Louis, MO. The paintings fill the halls with joy and beauty. 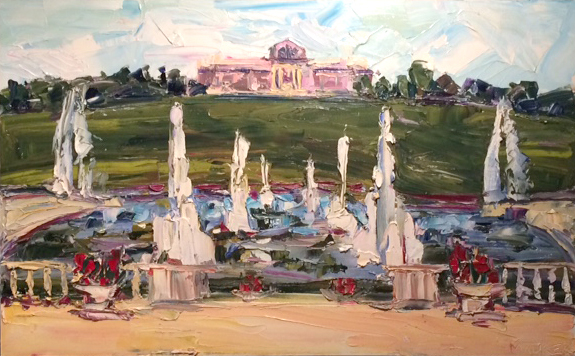 A highlight of the show is a view of Art Hill in Forest Park with the St. Louis Art Mueseum positioned up high and the fountains below. She also has paintings of Niagara Falls, Colorado, lighthouses, flowers, seascapes and more! For a personal tour of the art with the artist please contact her by email or cellphone. Wet Paint returns! Invited artists from around the country, as well as local celebrity artists, will be painting scenes in Tamworth during the third annual, week-long celebration, from April 29-May 5, 2019. You're invited to an art show by Jodie Maurer at the Willows at Brooking Park. The show includes new floral paintings, seascapes, forest landscapes, USA flag series, and a painting of the St. Louis Art Museum from Art Hill. The show will remain up from Memorial weekend through Friday, July 13th. Please join us for the artist reception Saturday, June 23rd from 2-4pm. The majority of Maurer's work was done on location. Three of the floral pieces were painted locally at Queeny park, St. Louis, MO earlier this spring. The St. Louis Art Museum (SLAM) was also painted plein air. The water fountains that lead up to SLAM capture the liveliness and romance of the location. Her seascapes are as gentle and refreshing as the shore breeze felt when viewing the distant lighthouse, and the strokes and application of paint are as bold and strong as the persistent waves. A real gem in her show is her forest painting with a few white trees (suggestions of birches) and a quaint cool stream passing through the hills. This painting was completed on location at Cascade Pass in the New York Adirondack Mountains. In this work she was moved by the deliberate forms and uses of color that flowed to her effortlessly, partially a result of her previous work and studies in the area. When painting plein air the artist is like a sponge, absorbing everything in sight that contributes to the strength and significance of the location. In addition to her landscapes, Maurer's USA flag paintings are displayed prominently in celebration of Memorial Day and the 4th of July. 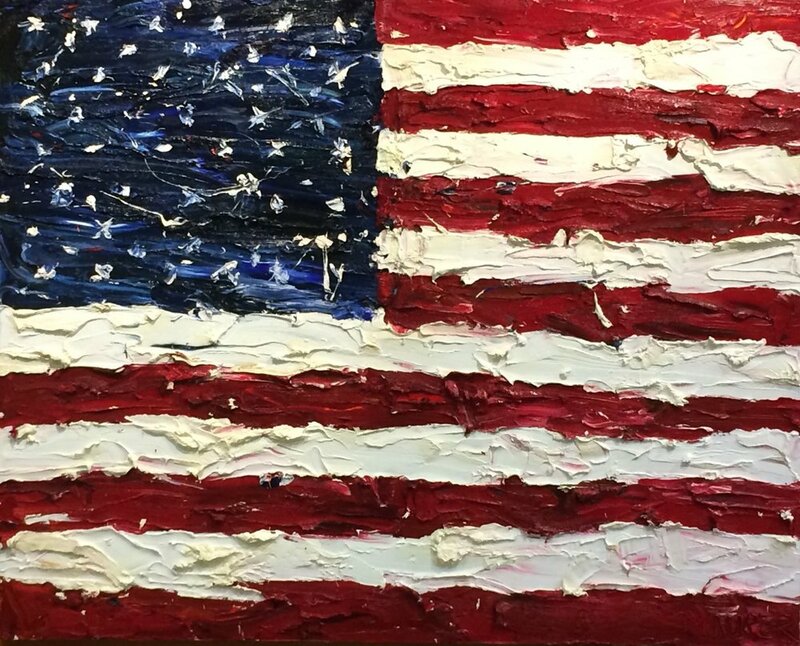 This USA flag series serves as a reminder of the brave acts that gave birth to this country and continue to protect her as well as the strong character and morality that are needed to sustain her. These flags are truly one of a kind, inspired, and full of vitality. A theme in her USA flag series is unity. The intermingling of the stripes and blending in the stars suggest that even though each state is individual and parts of the country are white, and parts are blue and parts are red they're all needed to make the whole. The show will remain hung through March. Follow me at the annual Stroke of Art plein air event in Boothbay Harbor, Maine! Rekindle the nostalgia of the Plein Air movement | Recognize the top tier Plein Air artists who have undergone rigorous training and dedication to master the century old painting technique | Welcome these artists to the magnificent Boothbay Peninsula to apply that technique in their own unique application. U City in Bloom, U City, St. Louis. When I begin a painting, I do not have a finished product in mind. Similar to poetry or composing of any kind, the outcome is unknown. It is an exploration of an idea. As the poet writes, his idea develops, questions arise, problems surface. The poem is the result of the development in thought. As it is with writing, so it is with painting. My approach is to capture the spirit of the land that makes this country my home, through thick layers of gestural paint strokes. I participate in Plein Air contests around the country and received Best of Show in Town & Country, MO in 2011, Best of Show in the “Farmer’s Market Quick Draw,” Booth Bay Harbor, ME in 2015 and Second Place in Moab, UT in 2015. The past two years, I lived in the Northeast. There, I focused on exploring ocean shorelines, the northern mountainous region, waterfalls, and the Hudson Valley. Currently, I reside in St. Louis, MO, pursuing the beauty of the Midwest. One thing I can assure you is that wherever I am, I will paint.